A new study led by Queen's University Belfast into how cheetahs burn energy suggests that human activity, rather than larger predators, may force them to expend more energy and thus be the major cause of their decline. Wild cheetahs are down to under 10,000 from 100,000 a century ago with conventional wisdom blaming bigger predators for monopolising available food as their habitat becomes restricted. The traditional thinking has been that cheetahs no longer have sufficient access to prey to fuel their enormous energy output when engaging in super-fast chases. But, in the first study of its kind, published today in the international journal Science, academics from Queen's, other Universities and conservation institutions have made the surprising discovery that, in the main, cheetahs do not use significantly more energy than other, similar-sized mammals. The scientists also discovered that, in searching for prey, cheetahs incur more energy loss than in outbursts of running which, although spectacular, are infrequent. So, where their prey have been reduced or re-distributed through human impacts, their ability to balance energy budgets has been severely curtailed. 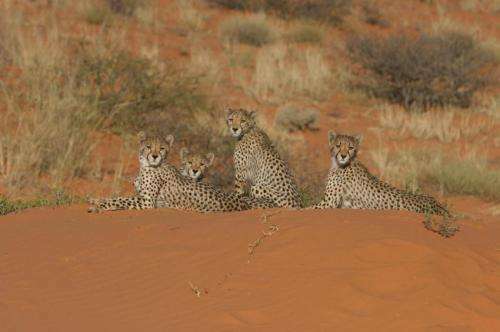 Lead researcher Dr Michael Scantlebury from Queen's School of Biological Sciences said: "We studied 19 free-roaming cheetahs each for two weeks across two sites in southern Africa, one in the Kalahari desert and the other in a wetter area. We injected heavy water into the animals before tracking them continuously and collecting their faeces. From these samples, we could determine how much of this heavy water they were losing each day and calculate their energy expenditures. "What we found was that the cats' energy expenditure was not significantly different from other mammals of similar size – cheetahs may be Ferraris but most of the time they are driving slowly. What our study showed was that their major energy costs seem to be incurred by travelling, rather than securing prey. If you can imagine walking up and down sand dunes in high temperatures day in, day out, with no water to drink you start to get a feel for how challenging these cats' daily lives are, and yet they remain remarkably adapted and resilient. "They can even withstand other species, such as lions and hyenas, stealing their prey. The reality may be that human activities – for example erecting fences that inhibit free travel or over-hunting cheetah prey – are forcing cheetahs to travel ever-increasing distances and that this may be compromising their energy more than any other single factor. Our study, which is the result of ten years' of research, seriously questions previously held assumptions about the factors affecting population viability in large predators threatened by extinction." Manuscript co-author Dr John Wilson of North Carolina State University said: "Too often we blame lions and hyenas for decimating cheetah populations when in fact, it is likely to be us humans that drive their declines. Imagine how hard it must be for a small cub to follow its mother further and further through the desert to look for food, while she herself is fighting for survival." Another key member of the research team, Dr Gus Mills from The Lewis Foundation said: "Having spent the best part of six years studying these animals in the Kalahari you get a good understanding at first hand of the challenges they face in order to survive, even without the detrimental impact of human activity."